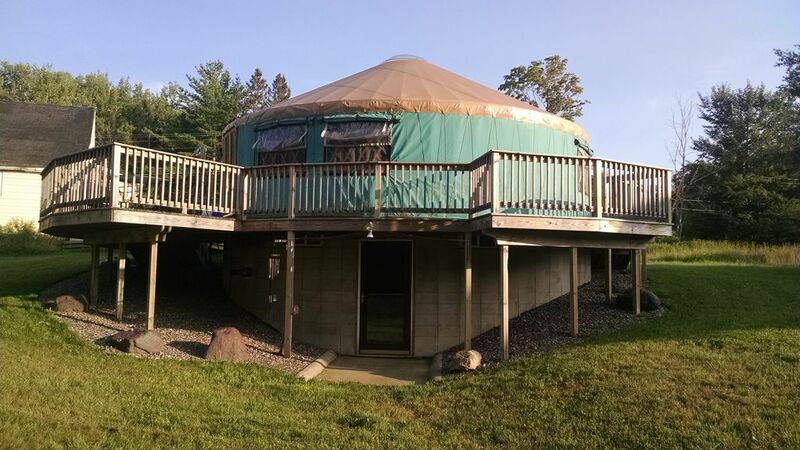 Very unique comfortable yurt home with full finished downstairs. Open floor plan sleeps 6+ Large deck for grilling, lounging out in the country. Close to great fishing hiking, skiing both downhill and cross country, destination mountain biking. Just up the hill from Lake superior Marquette, one of the best small towns in the country for quality of life. Six breweries in the area to visit after your day of fun. Then enjoy a hot sauna downstairs afterword. WIFI large screen monitor downstairs. Fast internet for streaming those three day Phish concerts. Lots of local history to check out as well. Two night minimum stay required. Although we love dogs, we must be firm on the "no pets" policy so please do not ask to make an exception. Awesome! Good for family w kids or all adults. Great hospitality, great set-up. Heat and plumbing! Definite luxury! We had a wonderful time staying in Don's yurt! The yurt itself felt like a "harry potter tent" as we approached a most basic and underwhelming looking structure outside and entered to find a spacious "cabin" with beautiful flooring, comfy furniture and a gorgeous walkout basement. We enjoyed a lovely sauna when the outside temps dropped. The only draw-backs were the highway noise that easily permeates the canvas walls and the run down house that is the first thing you see as you drive up. Overall though, a positively fun quirky VRBO experience. Would definitely love to visit again. Very quiet area with lots of space. Very unique place to stay. Just wish we had clearer skies so we could take advantage of the view out the top of the yurt. Very clean and well maintained. Had a very nice time. Thanks Don! The yurt was our home for a week of mountain biking. We enjoyed meeting the owner who is also a mtn biker. The yurt has very high-end amenities like soft-close drawers and nice cooktop. Basement has a large sauna. Marquette area has more biking than you can do in a month. The restaurants were all terrific. Other tourist activities if one doesn’t want to ride. Donnie was a great host and greeted us to introduce the must knows of staying in a yurt. The yurt experience was wonderful! Very comfy and cozy, and all of the amenities of a house are included. We definitely recommend it and look forward to returning for another stay!